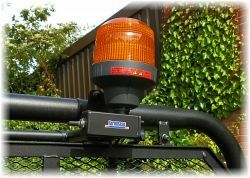 We offer an on-site Flashing Beacon regional fitting service for Multi Vehicle or Fleet Vehicle Operators. 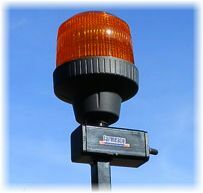 Flashing Beacons are essential for both the safety of the public and the vehicle operator. When used in public areas high visibility creates an early awareness of a moving vehicle, also visual awareness is paramount for the safety of the operator, for example on narrow twisting country lanes or fast open roads. 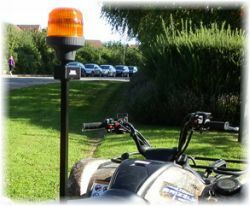 We produce Xenon Flashing Beacon Kits specifically designed for use on ATV’s. These provide a high output of flashing light for maximum visibility with the minimum power consumption, a major consideration on vehicles with limited electrical power output. The main mounting bracket is designed to fit rigidly under the rear rack. This holds a 1 meter upright pole which carries the Beacon and integrated on/off switch. The beacon pole can be raised or lowered in the bracket to suit the operating requirement, or totally removed by simply loosening a hand tight knob. Farmeasy Ltd are distributors for a range of market leading beacon manufacturers which includes: Vision Alert, Peterson, Led Autolamps, 247 Lighting. The wide range includes rotating (Halogen), Xenon and LED and we have selected the best value for money specified versions' to include in our kits. Click on a manufacturer below or the navigation above to see our kits for that brand. We offer the full range of products from Vision Alert, Delta Design and Peterson Europe. Please browse the catalogues below and contact us with your requirements.